Apparently the debate got a little feisty today and McConnell told a few untruths that Ezra Klein caught, one of which was an invocation of Constitutional principles about protecting the rights of the minority. Klein writes (and of course he's right) that this argument is a shameless abuse of history. There is no filibuster rule in the Constitution. Nor was the Senate supposed to operate in a markedly different or more deliberate fashion than the House. As Sarah Binder's super-handy history of the filibuster explains, their respective rule books "were nearly identical" in 1789. Both rulebooks included what is known as the “previous question” motion. The House kept their motion, and today it empowers a simple majority to cut off debate. The Senate no longer has that rule on its books. What happened to the Senate’s rule? In 1805, Vice President Aaron Burr was presiding over the Senate (freshly indicted for the murder of Alexander Hamilton), and he offered this advice. He said something like this. You are a great deliberative body. But a truly great Senate would have a cleaner rule book. Yours is a mess. You have lots of rules that do the same thing. And he singles out the previous question motion. Now, today, we know that a simple majority in the House can use the rule to cut off debate. But in 1805, neither chamber used the rule that way. Majorities were still experimenting with it. And so when Aaron Burr said, get rid of the previous question motion, the Senate didn’t think twice. When they met in 1806, they dropped the motion from the Senate rule book. Why? Not because senators in 1806 sought to protect minority rights and extended debate. They got rid of the rule by mistake: Because Aaron Burr told them to. And the first time the filibuster was ever used? 1841, when William King, this guy, threatened Henry Clay with a filibuster after Clay tried to bring an end to debate over re-chartering the Second Bank of the United States. 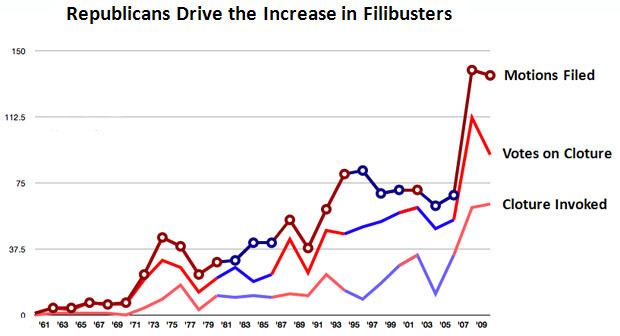 So enough with the Founding Fathers nonsense regarding the filibuster. They didn't trust the masses of people to vote in elections, but they fully expected Congress to vote on bills. Nowadays we seem to do the opposite. It's time to fix that.